The game gives you your first Pokemon, also called your Starter. The rest of your Pokemon must be caught. (Well, a few may be obtained in other special ways through the story, but most have to be caught.) There are over 800 Pokemon, but each game focuses on a subset of these. To catch a Pokemon, you have to initiate a battle with it and throw a Pokeball toward it. That doesn't guarantee that you'll catch it, though. There are a variety of Pokeballs that become available through the game and these have different levels of effectiveness for certain Pokemon types, locations, or other conditions. If you have two compatible Pokemon, you can also breed them. Parents need to be one male and one female of a certain group, called Egg Groups. The baby Pokemon will have the species and Pokeball of the mother. Some Pokemon have no gender (such as the rock Pokemon Lunatone). Those must be bred with a special Pokemon called Ditto. When you catch or breed a Pokemon, there's a slim chance (very slim) that it could be colored uniquely. These are what's called Shiny Pokemon. Originally, I think they were a bug in the game, but now they're highly valued by folks. As you play and win battles, your Pokemon gains experience and increases in level. The highest level possible is 100. Newly hatched Pokemon start at level 1. Some Pokemon evolve, or change into different Pokemon, as they reach a higher level. Some Pokemon never evolve. Other Pokemon evolve but under unusual conditions, such as the use of a certain item. It's worth noting that even though my Chespin is level 74 and has these statistics, it's still not a good Pokemon for battling. That's because Chespin is a baby-level Pokemon. He typically evolves at level 16 and then again at level 36. As he evolves, his statistics are greatly increased. But because I never let him evolve, his statistics remained low. It's possible to prevent a Pokemon from evolving, but it can be hard to battle competitively with it through the whole game if it remains in its baby form. Types are the categories of Pokemon, such as Water-type or Fire-type. Chespin is a Grass-type. There are currently 18 types. Each Pokemon has one or two types that describe it. It is a descriptive term, but it also defines Defensive and Offensive characteristics of the Pokemon in battle. Offense works a little bit differently. Just because a Pokemon is Grass type, doesn't mean that it will effect the opponent in a "grassy" way. It's the move used by a Pokemon that determines its offensive power. If a Pokemon uses a move type that matches it's own type, it gets 50% more power. This is called Same-type attack bonus (STAB). So generally it's a good idea for at least one of your Pokemon's attacks to match its type. It can also be handy to have some tricks up your sleeve - some attack types that are unusual for that type. They won't have the bonus mentioned above, but they may take your opponent by surprise. It can also be fun to have a variety of moves - it makes the game more interesting for me. Remember that your Pokemon can know 4 moves at any given time. There are currently over 700 different moves available in the main game series. Each Pokemon can learn a subset of them. Moves can be offensive or defensive. The games refer to them as Attacks, Special Attacks, or Status moves. Attacks are physical in nature while Special Attacks are more like beams of energy and "special" types of moves. Each Attack or Special Attack will have a power level (the amount of damage it does), an accuracy level (some moves aren't guaranteed to hit every time), and a power point (number of times you can use that move before you need to recharge it, usually done at the Pokemon Center). It's usually a good idea to teach your Pokemon either Attacks or Special Attacks, depending on which of those stats is higher for that individual Pokemon. For example, my Chespin's Attack stat is 133, but its Special Attack stat is only 99. So it would make more sense for me to teach it an Attack move rather than a Special Attack. Status moves can be used for a variety of effects, such as changing your Pokemon's individual statistics mid-battle or inflicting a condition on the opponent. My Chespin has a low Special Defense level, so I might consider teaching it a Status move that would boost that. Conditions include being poisoned, falling asleep, etc. Those conditions can reduce health or otherwise interfere with the opponent's ability to battle. They act a lot slower than actual attacks, but can be very helpful. Moves can be learned in different ways. The primary way is by leveling up your Pokemon. As they grow in level, new moves will become available to learn. Another way is by evolving. When a Pokemon evolves, it sometimes is able to learn new moves. Another way is by training it with what's called a TM. This is a move that is saved like a file in your game and you can teach your Pokemon that move any time from that list. Other moves can only be learned by breeding certain Pokemon together. As you learn new moves, you end up overwriting some of your old moves. (Remember, you're limited to a total of 4 moves per Pokemon.) If you overwrite a move but then regret it, the games give you the ability to re-learn the old move again. It's a bit of a process and requires a certain item in payment, but it is possible. "Overgrow: When HP (life meter) is below 1/3rd its maximum, power of Grass-type moves is increased by 50%." Other abilities are outside of battle. For example, my Pumpkaboo has the ability Pick-Up, which allows it to pick up extra items throughout the game. It's important to know your Pokemon's ability so you can utilize it to your advantage. A Pokemon can hold one item. This can have an in-battle or out-of-battle effect. There are over 200 items with a variety of effects! Each Pokemon also has something called a Nature. This is its personality. It's descriptive and also impacts its statistics. You cannot change a Pokemon's nature or reset its statistics once it's born. You can train and increase statistics through certain features like Vitamins, etc. So, let's put it all together. 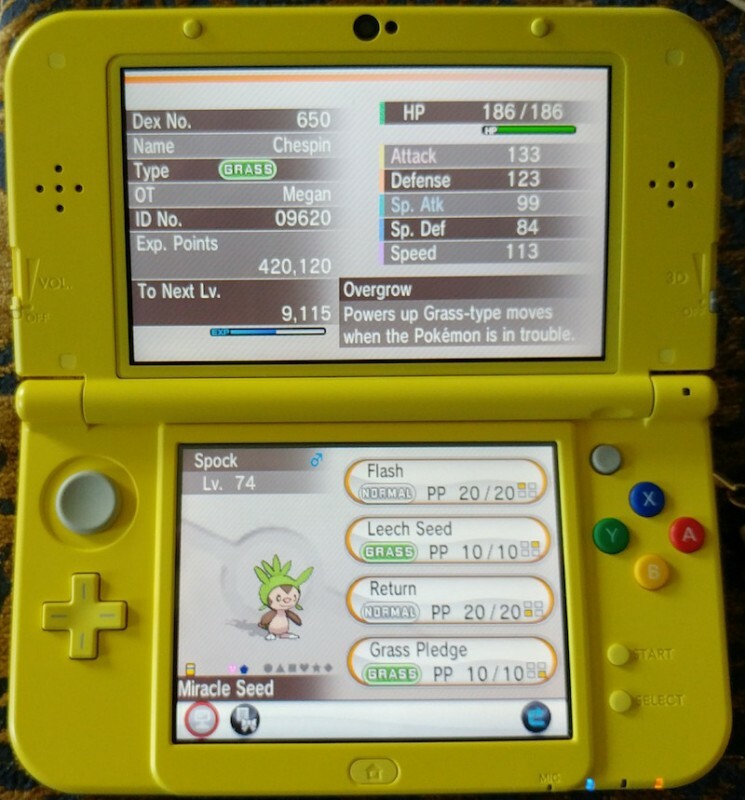 Here's a picture of my Chespin's overview screen. His species and type are listed on the top left. His individual statistics are listed on the top right. His ability is listed in the lower portion of the top screen. On the lower screen, you see his picture and his moves. He currently knows 2 Normal-type Moves and 2 Grass-type moves. Two of these are Status moves, one is a regular Attack, and one is a Special Attack.